Technique: You can use a tarot, Lenormand, or any oracle deck for this. There are two methods for doing this meditation. One is for learning tarot or a new oracle, the other is for divination. I’ll describe both. TO LEARN A NEW DECK: Sit in silence for about two minutes, focusing on your breath. Pull out your deck of cards, shuffle them, then randomly pull one to three cards from the deck and place them before you. (Pull one at a time if you’re learning a new deck.) Now examine each card you pulled. If it has a reverse meaning, observe the card reversed. Note the images, the colors, and the symbolism included. Finally, how does this card make you feel? It’s good to have a notebook for this one so you can note everything you see, what it symbolizes to you, and how it makes you feel. Wait until AFTER you’ve spent meditation time with this card to compare what you wrote with what the booklet or accepted interpretation of the card is. 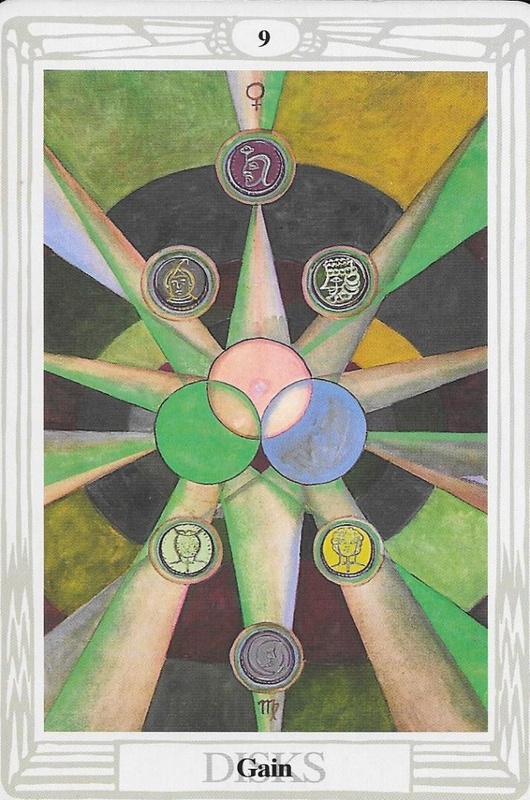 My Meditation: I am currently working through the Thoth deck. While I’ve been reading tarot since I was 16, like most people I started with the Rider Waite and eventually moved to my Medieval Scappini. I’ve worked with other decks over the years, but theThoth deck has always been a deck I avoided. I’ve owned one for years even! So I finally decided to sit down and really get to KNOW the cards in this particular deck. 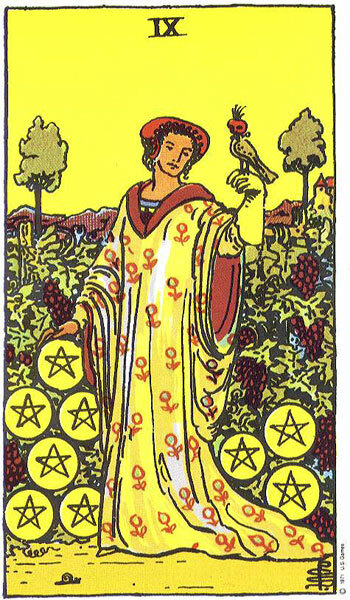 Today’s card is the 9 of Disks (Pentacles). Meditation Resources: Check out this tarot meditation. I don’t care for the music in it, but it’s an interesting take on a tarot meditation. Thoughts: I spent a half hour meditating on the nine of disks, then I read the description of the card. My view of the card overall (across decks) greatly colored my view of this one. However – I discovered in this deck, the card seems to symbolize a spiritual progress, or manifestation from the spiritual to the mundane. A favorable omen for the magician. This entry was posted in Magick, meditations, Spirituality, the writing life and tagged Meditations, tarot by Steph. Bookmark the permalink.